and ruin in commercial collapse. W.S. Jevons and then his son H. S. Jevons believed that cyclical behaviour of solar activity cause changes in agricultural output and therefore general economic activity. This has been named the “sunspot” theory. Although sometimes regarded as bordering on the bizarre, it is not too farfetched. Non-irrigated agrarian societies obviously would suffer pronounced effects upon agricultural production (and therefore incomes) from climatic alterations. It follows that relative large variations in agricultural production would lead to variations in supporting industries (forward linkages) and then impacts upon industrial output which use raw materials from agriculture (backward linkages) and eventually overall economic activity. As Jevons alludes to — and especially in a world where most of us live in an irrigated industrial society — it would seem that there are many other significant factors in determining both long and short term variations in food price — technology shocks, wars, energy shocks, social changes. 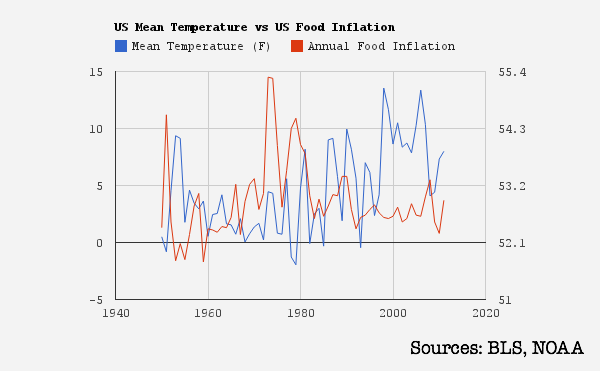 Food prices are a complex and multi-dimensional equation with a lot of variables. Some might assume that this relationship is transmitted via precipitation, and that less rain (i.e. 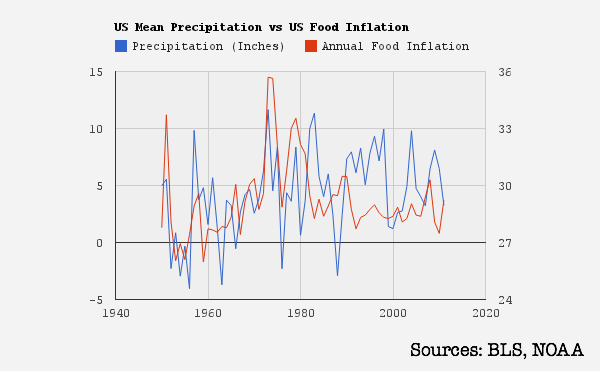 more drought) means less food growth, and therefore higher food costs. But this could work the other way, too — too much rain can also damage crops. So while Jevons was correct that there is an underlying association, there is clearly a lot more to it than the solar cycle especially in the irrigated, mechanised, fertilised modern agricultural world. 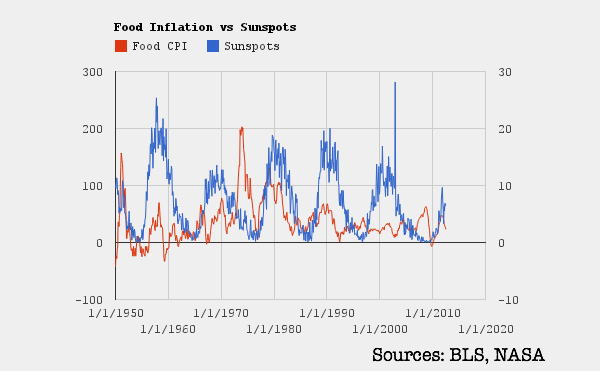 Certainly, it does not seem possible to predict food price changes based solely on the solar cycle, even though it does appear to exert a significant influence. This entry was posted in Current Affairs, Economic History and tagged candy, cows, drought, ethanol, feeding, food prices, h.s. jevons, solar cycle, w.s. jevons. Bookmark the permalink. ← Greeks Want to Stay in the Euro? Why Don’t They Move to Germany? Since the simplest of events is caused by an infinite number of events preceding, what’s the chance you can figure out something as complex as the ebbs and floes of global food production? Consider the number of factors you can list [and their potential inter-actions], not to mention the factors we are unaware of [and their potential inter-actions], and then the mere fact that the entire Universe is causally inter-related. Seems to me, that after such consideration, one might simply venture out to the food store [or your garden, preferably] pick a few ripe vegetables, pop open a beer, and enjoy the evening with the knowledge that you really can’t know much of anything! Well, each family having its own garden plot would help, plus provide Mormon-style insurance against interruption of food distribution from financial or satellite shutdown (from sun flare, super-nova, or enemy attack) chaos. That’s the best kind of self-insurance. This brings to mind the work of Edward R. Dewey who researched the cause of the Great Depression as the Chief Economic Analyst of the Department of Commerce under Hoover in 1930. Because he received a different answer as to why the Great Depression occurred, Dewey lost faith in economics as it was understood at the time and started to look at different explanations for what was driving the behavior of businesses. In 1947 he published a book titled Cycles that explains the underlying cycles behind economic behaviors. What’s interesting about reading through this book is that they forecasted mega-trends back in 1947 and have been stunningly accurate on the years when recessions would arrive. I flipped through their book a few months ago to see what 2012 looked like from their plots and all the minor-major downside trends of cycles line up on this year as having significantly low business activity. Any such “multicyclic” approach must be set down as a mystical adoption of the fallacy of conceptual realism. There is no reality or meaning to the allegedly independent sets of “cycles.” The market is one interdependent unit, and the more developed it is, the greater the interrelations among market elements. It is therefore impossible for several or numerous independent cycles to coexist as self-contained units. It is precisely the characteristic of a business cycle that it permeates all market activities. Rothbard did not seem to realise that sunspots were independent of activities in the terrestrial market. Vice verse???? I thought the right expression was vice versa. Aziz, here are a couple of recent food happenings that support your (and my) libertarian/minimal government philosophy. The (Obama) federal government recently cut off irrigation water to California’s San Juaquin Valley, a major source of produce, in order to protect a small non-commercial fish. There are more U.S. fruit & vegetable consumers than nutty environmentalists, but the latter are better organized for political voting and contributions. * Pickens was right. 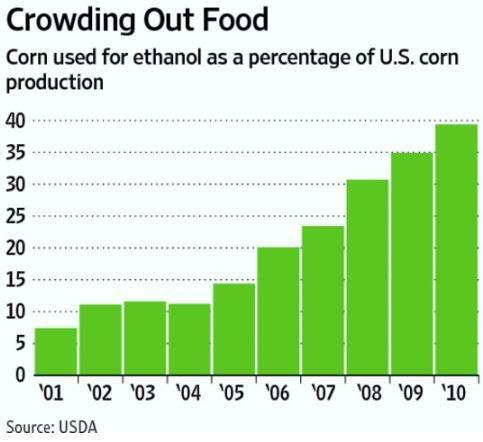 Ethanol is derived from sugar, scarce in corn but abundant in cane. [When energy OUT is < or = to energy IN, the process is energy INefficient]. US government is misallocating a lot of capital and resources by mandating corn subsidies for ethanol. The environmentalists should focus their attention on real clean energy, i.e. solar power, and they should focus on the free market (solar — at the right efficiency level — wins against all other fuels, because the input is almost completely free, so EROEI can be a huge number) and not government subsidies. I believe there are cases where environmentalists have opposed large (grid-feeding) solar projects because of the acreage “used”. Then there is Teddy Kennedy’s opposition to windmills around Cape Cod, “because that’s where I sail”. I’ll respect the competitive and minimally-regulated free market. Funny, we forget to keep reminding everyone that choice (competition) is LIBERTY in people’s economic lives, and that government (monopoly) is FORCE, “like fire, a dangerous servant and a fearful master”. Something important is missing from the chart: the world’s population growth in relation to ….. The worlds population growth together with the climate and land destruction affact food prices. If I may, let me toss in a reference to a year-ago +/- essay by Jeremy Grantham(?) making a (convincing) case that Malthus’ overpopulation thesis* is finally going to happen: industrial civilization’s elevation of consumers from peasant to “middle-class”** involved small populations until late-20th century; now the massive populations of China and India are making the transition. * Population growth is exponential while growth of resources is arithmetical. ** The ability to eat meat is the principal “inefficiency”. 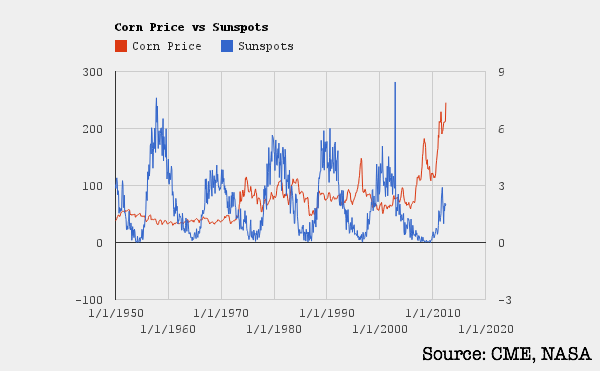 If we’re talking specifically about the corn price (as well as by extension the soy and wheat prices), we should consider why it wasn’t growing at the rate it is growing today when the population was growing at a similar rate during the 80s and 90s. 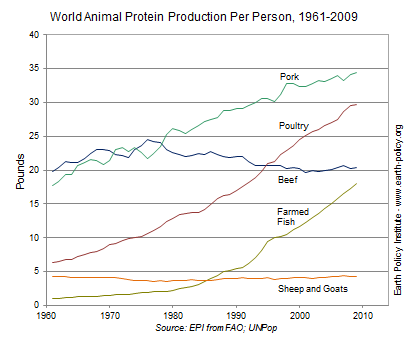 The closest I want to come to considering population per se is looking at rising meat consumption (which is the real thing that has changed since the 80s and 90s). Malthus by the way has always been wrong about everything. Malthusian arguments (like those at the peak of stock bubbles) often amount to “but this time it’s different”. And then it turns out not to be different. I think the ancient practices of timing events based on the Lunar and Solar Cycle may have some relevance. Perhaps the ancients notices manic or despondent periods in men, when auction prices were more favourable to the farmer and tax collector (King/Priests/Ruler). My interest in Neuro-psychology and finance has lead me to to speculate on the probability of celestial influences on brain chemistry and hormone release. If a Flower or Coral can sense the moon cycle, why not innate instincts in man? I have read into Lunar Cycles and the market and the theory has been disproved or is lacking in rigorous research, but I do think we still don’t understand the science. Perhaps the Oligarchs, 0.01% have an innate judgement of market turning points that separates us from them. With Central Bank interference in markets today, and HFT it would be impossible to measure. But I believe the unfettered markets of Adam Smith and Jevon’s era were possibly influenced by solar activity and crop yields. His theories do not agree with the Judaic/Christian teachings. The Sun being our ultimate life giver is given less credit today than we gave it 3000 plus years ago. Now Ben Bernanke is more powerful than the Sun. Idol worship is a sin! You don’t need a brilliant innate judgment of the market. You just need to watch the fundamentals very carefully — my two favourite variables are credit growth and industrial production growth. If I had been watching those over the last 50 years and acted accordingly — buying tangibles during higher credit growth, and equities during higher industrial growth — I would have done very well. Although past performance is no guide to future performance, I think that it is a fairly fundamental relationship.